Hi! I am Tinto, a lightship. 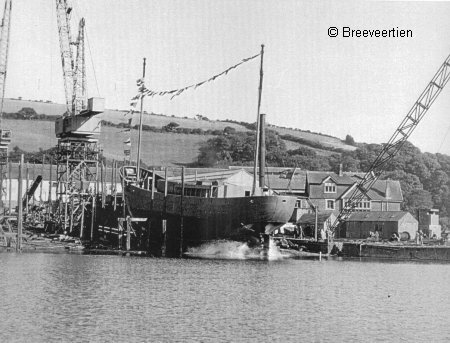 I was built in England and launched on August 15th 1951. That means I am a Leo, as the webmistress of this site. Originally I had no name, just a number. I always felt jealous of the ships who had their own names and mottoes. I worked in the Irish see, helping other ships to avoid dangerous places. The Irish sea is stormy, especially in the autumn and in winter times. Once I broke adrift but managed to get back. With the advance in modern marine navigation, there is not much need for lightships. Many of us have been forced to retire. I had to quit my service in 1988. 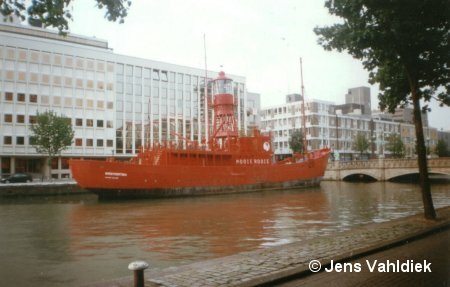 I was very upset because the most important thing for a lightship is to give light and to help others find their way. Soon after my retirement I came to the Netherlands. I was even more upset when I realized that I would become a floating restaurant. Isn't it sad to know that nobody needs your light? I was unhappy even when I finally got my own name, Breeveertien. That was the name of an area in the North Sea. Later on, the name was painted over and I had nothing but a number. On a gloomy autumn day, a strange visitor came on board. She could actually talk to ships! It turned out she was not a human being but an aeroplane who can turn into a human girl! Her name was Soleil. She called me Tinto, by the name of the restaurant on my board. Together, we started an unusual journey. We passed the misty Border of the Worlds and reached the Lighthouse of All Ways. But the Lighthouse with two good-hearted winged maidens, its keepers, is a story in its own right, which I will tell later. The Lighthouse guided us to the Star Harbour. The Star Harbour is an astounding place! You can find there all ships from the past and some that are still present upon the earth. Soleil and I met there our old friends and made some new ones. 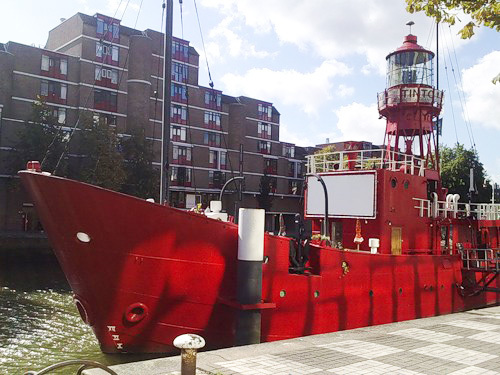 And, most importantly, I became once again a lightship! Not in the Irish Sea but in the Star Ocean. Now I live both on earth and in the Star Harbour. I've come to understand one important thing: even working as a restaurant, I keep giving light. My light is still needed here on earth. Perhaps it is not as bright as in the Star Ocean, but it reminds people of something very important. If you happen to be in Rotterdam, welcome aboard! My address is Wijnhaven t/o 101, close to Leuvehaven metro station. You can also visit the open air museum and see there my friends, the ships from different times. The photos are from www.feuerschiffseite.de The third photo is by Almira Ilvairie.